Nachos are hands down one of the funnest things to eat. You can freestyle them however you like and they’re always a fan favorite. This year, I’m making a splash at all of the Game Day parties by bringing Platano Nachos. They’re unexpected and sinfully delicious! I combined a few of my favorite recipes to bring together this powerhouse dish that leaves everyone wanting more! 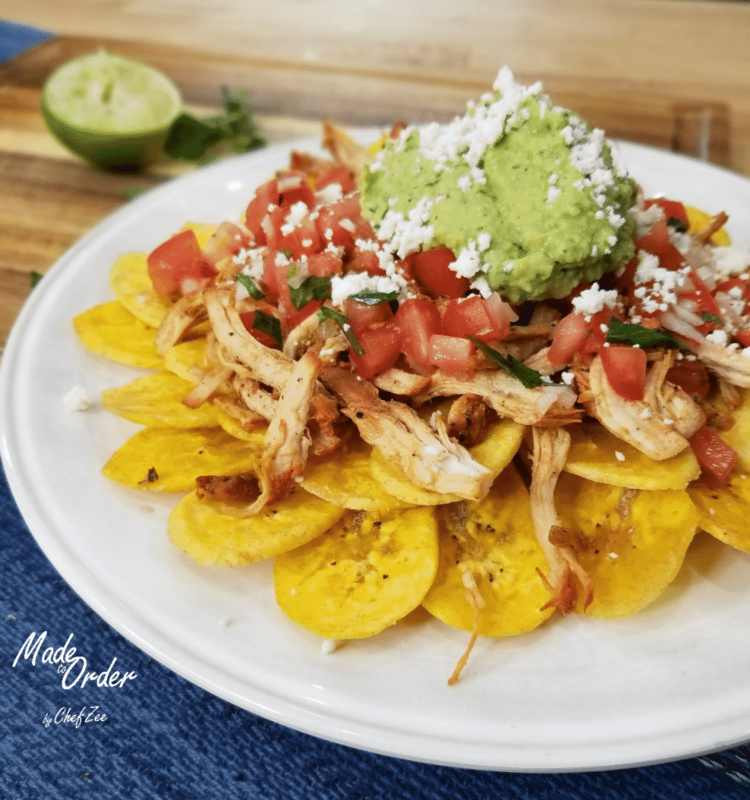 To start, I’m making this dish using Chicken Ropa Vieja | Shredded Chicken which is a dish that I’m known for in my family partly because my Chicken Pastelitos/Emapanadas are a HUGE hit. Next, I build the nachos using Mariquitas aka Plantain Chips and I top it all off with my Pico de Gallo, Avocado Salsa, and Queso Fresco. Platano Nachos are a refreshing take on a classic party dish. You will not be disappointed! Don’t forget to visit my YouTube Channel for step-by-step instructions on How to Make Platano Nachos! After a few minutes, once plantains are golden, remove from pan and drain excess oil onto a paper towel. Set aside. In a small-medium mixing bowl, combine diced tomatoes, onion, 1 tbs cilantro, salt, pepper, and ½ lime in order to make a Pico de Gallo. For more details, feel free to see Pico de Gallo blog post and YouTube video. Mix together and set aside. In a food processor or blender, add avocado, fresh lime, garlic, pimiento pepper, jalapeno pepper, salt, pepper, olive oil, water, cilantro, and sour cream. Pulse/blend until you reach desired creaminess.